Maha Periyava life incident - "After all I too am a beggar !" It was the peak of summer. The village suffered from scarcity of water. It was a tremendous task to gather and store drinking water. We had to walk two miles to fetch water for Periyaval's bath and anushtana. The attendants were given one bucket of water each for their bath. Periyaval was performing his anushtana seated under a tree a little away from the building where Sri Matam camped. A beggar and his family of several children went from house to house and returned disappointed, not getting what they asked for. The attendants watched this . Was the village so poor that it could not give a fistful of grain to the needy? Not at all! The people in the village were quite prosperous and could afford to give away ,why just a fistful of grain, even a bit of silver in charity. But then this family was seeking for water ,that too drinking water! Did that mean that there was not even one pot of water in any of the house? Of course not. When water had to be hoarded with such difficulty how was it possible to give away a pot full? Besides who was asking for it anyway? Not anyone important .Only a beggar family. They would come to no loss if they did not oblige this family. Periyaval sent an attendant to fetch the family. He then instructed the attendant to give away fully, all the water stored for his anushtana . He stood watching for long with a gracious look in his eyes as the members of the family cupped their palms together and drank the water hastily . The visitors drank till they could drink no more and left with their hearts brimming with gratitude. In a voice loud enough for the attendants to hear , Periyava said, "After all I too am a beggar !" 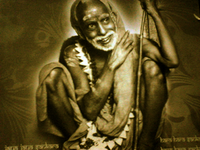 "Yes " , said a cheeky young attendant ,"Periyava lives by biksha !"